Looking for something with character? Want a house that actually feels like a HOME? Well, this Lake Hartwell waterfront home might be just what you've been waiting for! Centrally located between Seneca and Anderson, Shenandoah is a restricted subdivision with no HOA. This adorable custom Cape Cod style home was originally built in 1996, with a beautiful master suite added in 2006. Exterior features include durable cedar siding, Bermuda style shutters (handmade by the seller), a metal roof, double pane wood windows and a circular driveway. On the right side of the home, you'll enter through a huge sun room, which provides a great additional living or dining space with tons of natural light. It is heated & cooled, so it's great to use all year long. The kitchen features Thomasville self-closing cabinetry with hidden trash bin, farmhouse sink imported from England, a breakfast bar, large pantry, stainless steel appliances, and Lexington island which will stay with the house. 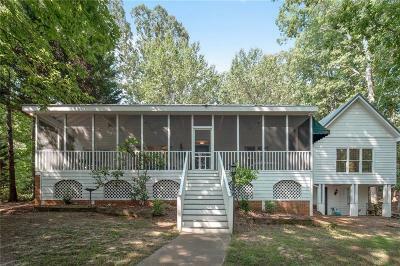 Located just beyond the kitchen is the main living area, which has a fireplace with gas logs, as well as access to the 45 foot long screened porch located on the lake side of the home. An additional space on the opposite side of the staircase is currently used as a den, but would be a great study or even a guest room. Much of the main level has reclaimed heart pine flooring, as well as salvaged wainscoting, trim, and doors, which came from a historic home owned by the sellers' family. Also located on the main level is the spacious master suite, with the bedroom alone measuring 17x14.5. The master suite includes a walk-in closet and a full bathroom with double pedestal sinks, garden tub, and walk-in shower. Additional master bedroom features include several large windows offering plenty of natural light, seasonal lake views, crown molding, and engineered hardwood floors. The main level also has a second full guest bathroom that includes an antique clawfoot tub and is accessible near the kitchen or through the den. The second level includes a third full bathroom and 2 additional bedrooms, each with a walk-in closet. With several extra closets, as well as attic space, the home has plenty of storage. An unfinished workshop is located beneath the master. Townville Boat Ramp is less than 1 mile away.